Awning Company Web Site Redevelopment :: INHOUSE Productions Ltd.
An example of a design refresh of an existing web site hosted on a custom CMS. 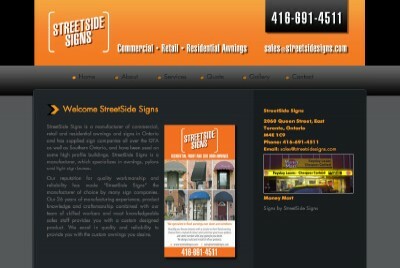 INHOUSE was tasked to revise the branding of the company and update the web site to match. The work was completed within just a few short hours by simply replacing the image content and modifying the CSS stylesheets. By doing so, INHOUSE was able to provide a complete overhaul in an expeditious and cost-efficient manner. Development completed May 2013.